I love No Bake Cookies, and I love bar cookies. No bake cookies are super quick to make, and bar cookies don't need any fussing around with shaping or frosting each individual cookie. These recipes are ideal for very hot summer days, when the kids are bored and want to do something. Teaching them how to cook is one of the best things you can do for them because it's a skill they'll take with them and use for the rest of their lives. And it's fun! These quick and easy recipes are all delicious. I make these Special Kay bars about once a week for the kids at my husband's high school. They love them! These bars are very quick; I can put them together in about 10 minutes. They're creamy and rich, not too sweet, and have the best flavor and texture. These bars are rich and easy to make. They use cocoa flavored crisp rice cereal along with chocolate chips to make a super chocolatey bar cookie. I added peanut butter to the frosting, since the original recipe didn't use any, which I think makes the frosting smoother. But you can leave out the peanut butter if there's an issue with it. What could make Rice Krispie Bars even better? Peanut butter. And what improves on that? Peanut butter cups! This peanut butter marshmallow treats recipe is simply sensational. This recipe is super sweet, so be warned; you have to cut them into tiny pieces. This is my sister Laura's favorite bar cookie. If you like pralines, you'll love this recipe! These bars taste just like Peanut Butter Cups, hence the name. But if you've ever made the knock-off peanut butter cup recipe, there's lots of fooling with coating miniature candy cups, filling them, then re-coating, and all that nonsense. These bars are much faster to make and they're even better! A dry chocolate frosting mix (I think Jiffy is the only manufacture of this product) is the secret ingredient in these chocolate super rich bar cookies. Lots of marshmallows, chocolate chips, and pecans make it Rocky Road. 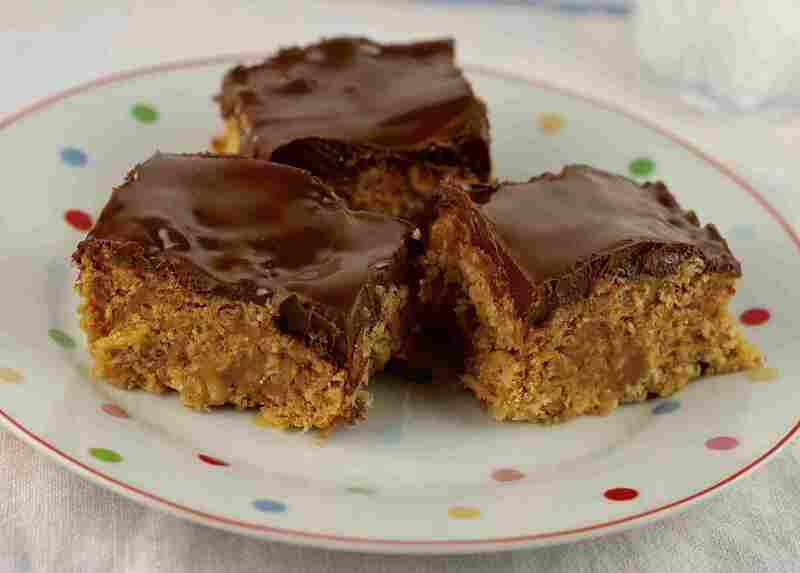 Graham cracker crumbs form the base of this bar cookie, and it's topped with a filling made from instant pudding mix. These bar cookies, which originated in Naniamo, Canada, are super rich and creamy. The crust for this unusual and delicious bar cookie is cooked on the stovetop. You make a custard of butter, sugar, eggs, and lemon juice, then stir in vanilla wafer crumbs, marshmallows and coconut. A lemony cream cheese frosting tops the base. Yum! Just about everyone has made S'mores. You know - you toast a marshmallow over a campfire (and it usually burns), then you make sandwiches with the hot marshmallow, graham crackers, and a candy bar. This recipe is so much better! First of all, there are no burned marshmallows. Secondly, there's more chocolate. Third, they're easier to eat. And finally, this recipe makes a ton, so you can eat them to your heart's content! Dried cranberries are stirred into the base for Special Kay bars, so these bar cookies are a bit more nutritious. And there's no frosting, so you can eat them sooner! Use your favorite dried cereals, or substitute any type of nut.